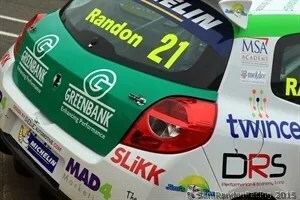 SAM Randon is hoping to go up a gear after finishing third in the Michelin Clio Cup Series Championship. 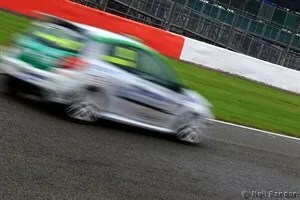 The Ashbourne racer went into the final event at Silverstone holding on to third place with Luke Pinder snapping at his heels. 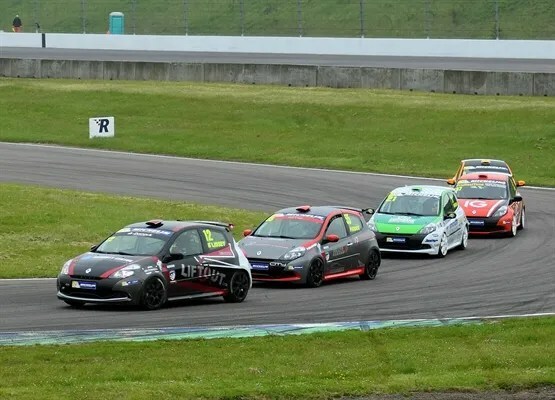 And despite being forced to retire in race one, he recovered to finish third in race two to make sure he was not overtaken in the final standings. And now he has his sights on going up a level. 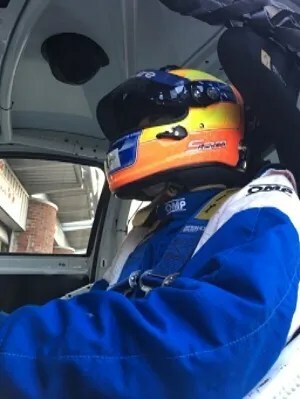 “I’m hoping to compete in the UK Clio Cup which races in front of the British Touring Car Championship crowds, which approaches 40,000 people at each event,” he said. 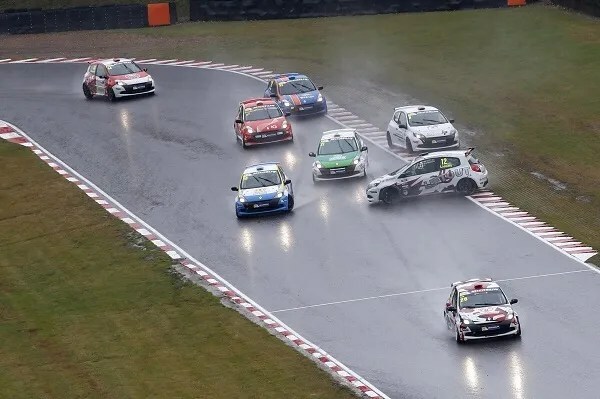 Randon made a flying start to the first race but after contact from behind, soon found himself in fourth, behind Pinder and desperately trying to gain ground on his rival for third. 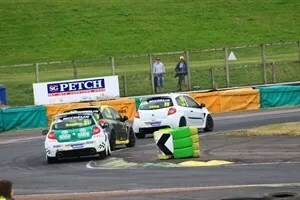 Pinder ended up in the wall, while Randon had to retire with his steering seriously damaged. But that was quickly repaired by his Westbourne team and he fared better in the second race. Championship winner James Dorlin won, leaving Randon to battle for second with Brett Lidsey. 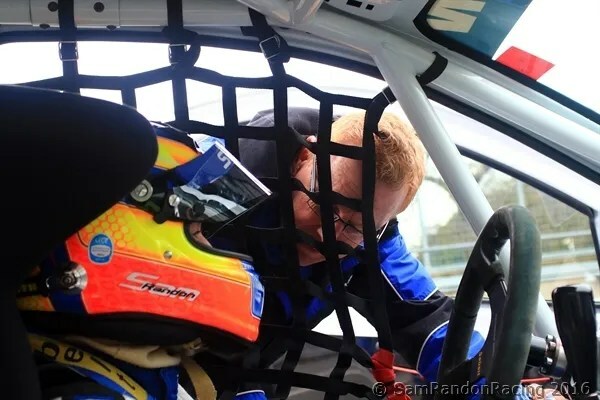 “I did actually get past Brett on the penultimate lap down the Hanger straight but my wing mirror had folded in so I couldn’t see where he was behind me and he retook the place on the straight back,” said Randon. Cup series resumed in Wales. 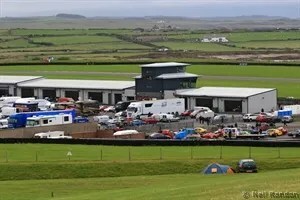 Ashbourne racer Randon had what was effectively his second race win of the season in the second race at the spectacular Anglesey Coast Circuit – coming in behind his own driver coach, James Colburn, who was driving as a guest and not scoring points in the series. Randon therefore added maximum points to his tally to consolidate third place in the series. 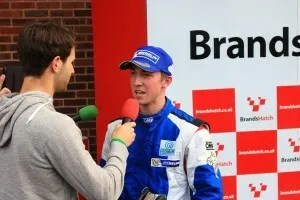 He had come fourth – effectively third – in the weekend’s first race, which was also won by the experienced Colburn. The series now has one meeting left, at Silverstone on October 8 and 9. The racers had to cope with a mix of conditions on the exposed circuit, with plenty of rain on the Saturday. “The course is perched literally on the cliff tops and has a reputation for being beautiful – or totally wild,” said Randon’s father, Neil. “We had both. Saturday was wild, Sunday was nice. 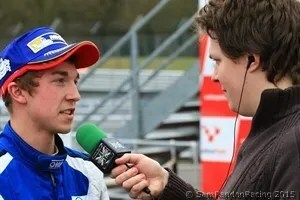 “It was the first time for Sam at the circuit and, due to budgetary constraints, he could not test there like other drivers. Qualifying went ahead – just – in very wet conditions with a tenth of a second separating the leaders and Randon in fourth on the grid. He slipped to fifth after running wide at the first hairpin but got back up to fourth and was dicing with the three leaders. Colburn pulled out a gap and despite his best efforts, Randon could not get past the other two to finish higher than fourth. “It was a great battle and the car was really good so I knew i had the pace,” he said ahead of the second race. What he had to do then was go out and prove it and, again starting from fourth, he did just that, with a much better start, moving straight up to second, behind Colburn on pole. therefore technically last but they charged away from the rest of the field and eventually got more than 10 seconds clear to negate the penalty. 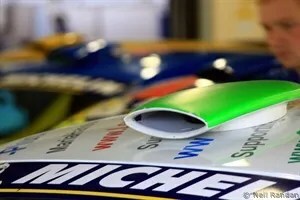 “I didn’t know about the penalty, as I couldn’t see my pit board or the penalty board,” said Randon. Colburn was delighted with the efforts of his young charge to get past him and, when he couldn’t do that, to stay with him. “Sam did really well,” he said. “I really needed that,” said Randon. “It feels like a win, even though i was behind James. Neither Randon nor Colburn felt they had jumped the start and video evidence supported Colburn. It was inconclusive in Randon’s case. 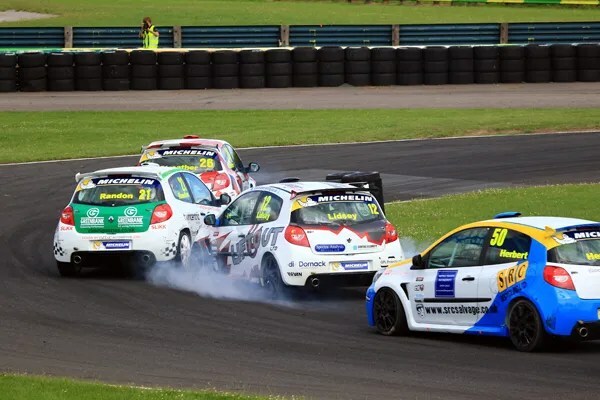 SAM Randon admitted his Clio Cup title challenge was over after a disappointing weekend at the Croft circuit, near Darlington. Involved in a coming together with other drivers in both races, Randon was only able to finish one and now finds himself a long way behind the series top two, James Dorlin and Brett Lidsey. “That’s the end of my championship challenge. James and Brett are too far ahead now,” said a disappointed Randon afterwards. Randon was in an early pole position in qualifying but slipped back to fifth when he hit traffic towards the end of the sessions. 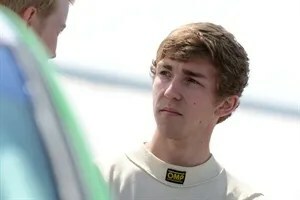 He made a good start from fifth on the grid in the first race but he was spun out by contact with Luke Pinder’s car as Pinder attacked through the chicane, dropping to seventh. He eventually battled back to fifth, although his tyres were shot. 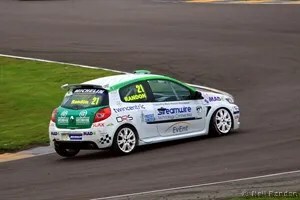 “The result didn’t do justice to Sam’s effort,” said sponsor James May. In the second race, Randon felt the line was his as he attacked Pinder – the other driver didn’t see it that way – and the cars touched. 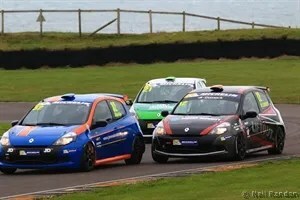 This time it broke Randon’s steering and his race was over, leaving him fourth in the overall standings with four races left after a meagre points haul. Two of those are at Anglesey in North Wales in September, before the season concludes at Silverstone in October. 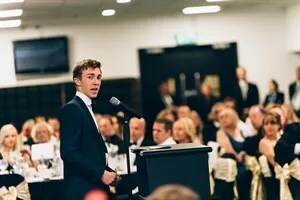 Fresh from his win at Brands Hatch, Sam stood up and presented his racing world to a captivated audience of 100+ corporate guests at the m&dee charity ball last weekend. Sam was originally introduced to the charity via headline sponsor Greenbank Group, whose Managing Director Charles Conroy is himself a trustee of the Maria Hanson Foundation. Selling the roof space of his car to raise funds for the charity, Sam was invited as guest speaker by charity founder Maria Hanson MBE who also made Sam a ‘charity advocate‘ on the night. The charity ball raised over £3,500 for the Maria Hanson Foundation providing short holidays for families dealing with serious or terminal illness. 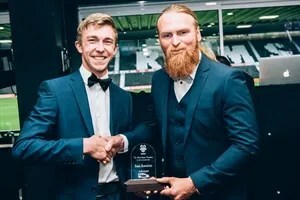 Sam was presented with a ‘Charity Advocate’ award by Iraq war hero Karl Hinett. Sam kicked off his presentation with the following video. Play it loud! 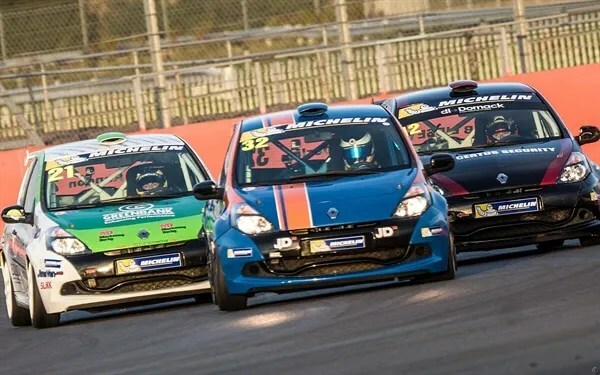 SAM Randon landed his second win of the season in the Michelin Clio Cup series – providing dad Neil with a perfect birthday present. 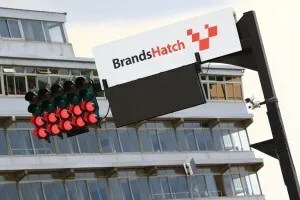 Winning at Brands Hatch on Sunday in the second race of the weekend was a perfect tonic for Randon after he had been denied victory by the weather in Saturday’s meeting opener. 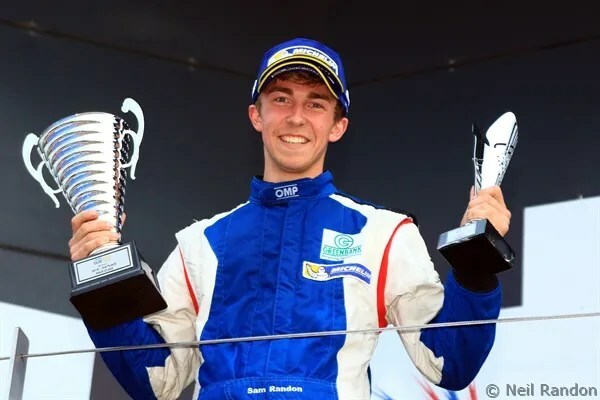 Randon had been leading, relishing the wet conditions, with his karting background coming to the fore, when officials decided conditions were too treacherous to continue. He then came fourth when the race was re-run, with title rival Brett Lidsey taking the win. It proved a bizarre weekend weather-wise, all round, with qualifying held in bright conditions. There was little between the three main title contenders – Randon, Lidsey and series leader James Dorlin (Randon’s Westbourne Motorsport team-mate) but it was Dorlin who nicked pole, 0.1 seconds faster than Randon. The racers started the first race on slick tyres but rain was soon falling. “Sam loves these conditions and immediately took first place,” said his father. “His karting experience came to the fore on slick tyres in the rain. He’s been very successful in the past in these conditions. That led to cars leaving the track to have wet tyres fitted and then a restart in a downpour – but that was promptly red-flagged again as too dangerous. When conditions relented and the race was re-run as an eight-lap shoot-out, Randon found it more difficult. “I just didn’t have any grip this time,” he said. “I’ve never experienced such a lack of grip as these tyres are usually amazing in the rain. The next day dawned dry, however, and Randon was determined to put things right, starting again from the front row alongside Dorlin. He had a blistering start and reached the Paddock Hill bend in first place. This time, he was to hold on to it, as he and Dorlin broke away from the pack. Later, Dorlin dropped back and Lidsey took up a determined chase, two or three seconds back. What a birthday present for dad! With two laps left, Lidsey was on his bumper but Randon held on to strengthen his chances of landing the overall title. “I felt the pressure all the way and seemed to catch the back markers in all the wrong places, so Brett was able to catch me,” he added. “Didn’t just age one year – I think in that 20-minute race I aged another 10! 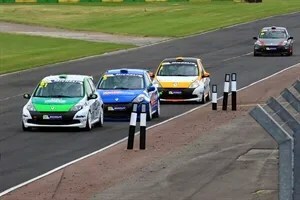 The next race is at Croft in four weeks. On Saturday, Sam Randon will be a guest speaker at the 10th anniversary ball for the charity he backs, the Maria Hanson Foundation, which provides breaks for families in which one member is suffering from a life-limiting or life-threatening condition. 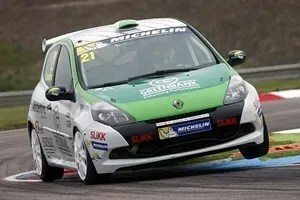 SAM Randon endured a disappointing weekend at Rockingham in the sixth and seventh rounds of the Michelin Clip Cup series. It all looked good when he posted the fastest times in all six practice sessions on a cold and overcast Friday but qualifying, in warmer conditions, was not so good and he finished third. He started well in the first race on Saturday, passing Luke Pinder and vying with pole man James Dorlin, his Westbourne team-mate. Pinder fought back and Randon ran third for a few laps, challenging Pinder, before Brett Lidsey slipped by and Randon slipped back to finish sixth. Starting the second race on Sunday third on the grid, Randon again had a great start but found himself on the wrong side of the road at the hairpin and back in third. Randon never quite felt he had the pace for a real challenge but he came fourth, scoring good series points. Dorlin won both races to extend his lead overall. “I was happier with that,” said Randon. “It was a great race but I just didn’t have the legs to really mix it with the guys up front. 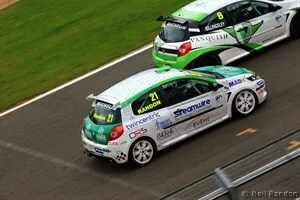 SAM RANDON has won his first race in the Michelin Clio Cup series. 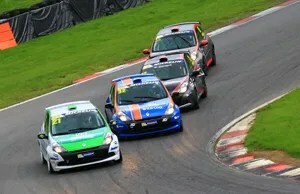 The young Ashbourne driver also added two third places when the series held a tripleheader at the Pembrey circuit near Llanelli in Wales at the weekend. His Westbourne team mechanics had swapped the engine and diagnosed a gearbox fault, so Randon entered the weekend full of hope. He and team-mate James Dorlin, who won the opening two races of the series, set the pace in qualifying. 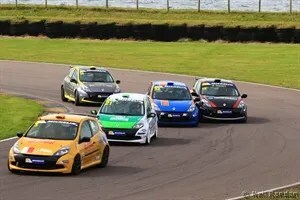 A poor start allowed Dorlin to take the lead and a wheel on the grass saw Randon down to sixth in the first race. Annoyed with himself, Randon recovered and set the fastest lap on his way back to third place by the end. 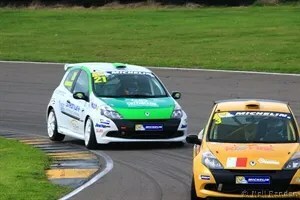 In race two, Randon escaped a melee at the first corner which turned him sideways and emerged second. Leader Brett Lidsey made a mistake on cold tyres and Randon nipped past him on lap two. From there, he built his lead with each lap and finished 11 seconds clear to claim his first win – and in front of headline sponsor Greenbank Group and their guests. Although he started on pole for the third race, Randon could not do it again, Lidsey taking the win with Dorlin second and Randon again third. “I’m a little bit disappointed with two third places but it’s a good haul of championship points, so I shouldn’t complain.” he added. 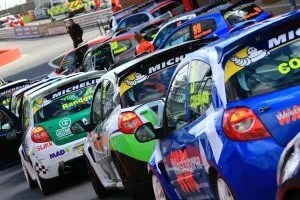 Sam’s next race is at Rockingham Motor Speedway near Corby on May 28/29. 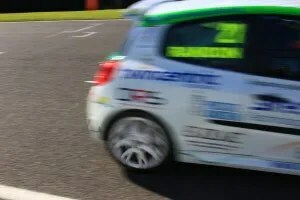 Technical gremlins frustrated Ashbourne racer Sam Randon’s 2016 season opener at Oulton Park in Cheshire. 21 year old Sam was left on the backfoot already for the 2016 championship as his teammate and rival James Dorlin took both wins of the weekend. Sporting a new livery and new for 2016 sponsors, the early morning qualifying was challenging for all drivers as the cold March weather did not work well with the temperature sensitive slick tyres. Despite being at the top of the timings during the Friday test day, Sam only qualified in P5 and could not get a fast lap in when it counted. “Lap times were getting faster and faster and I pushed too hard in my last few attempts and to be honest I was lucky not to hit the wall. It will be tough from P5” said Sam. 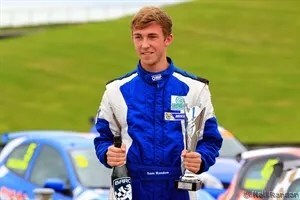 Sam’s characteristic flying start launched him up into P3 by the first corner of race 1 and set him in pursuit of Dorlin and Lidsey at the front, whom he followed for 12 laps but could not catch, finishing with a very welcome season opening podium. 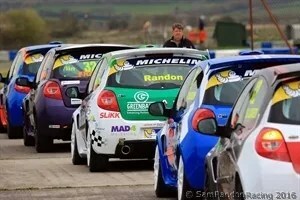 From a P4 start in race 2 Randon again launched off the line and set off chasing his two rivals. “I could tell something was wrong from the off” said a dejected Sam who discovered a niggling engine fault had returned at the worst possible time. “There was no power out of the slow corners and within 2 laps I was in last place. It was painful trundling around at the back for 12 laps just to get a few valuable points”. 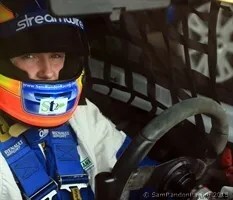 The Streamwire Group has become a major sponsor of SamRandonRacing for 2016.Comprising the Streamwire brand name and newly acquired Event Computer Services the deal ensures eye catching and prominent branding on both the car and Sam’s helmet. Streamwire ensures that whatever technology choice you make now does not restrict the future but at the same time, stays connected to the decisions of the past. Proud to be vendor agnostic, they support our customers with their technology strategies, solution design, procurement, build and then run. Established over 25 years ago EvEnt is an independent Apple technologies specialist, whose high-level technical skills are widely recognised in the market. It is privately owned and self-financed which has enabled it to keep overheads low and pass on the savings to its customers. 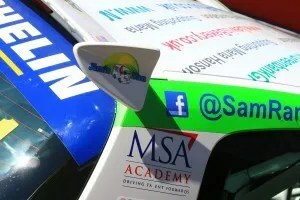 The new livery on Sam’s race car features a charity fund raising feature on the roof of the car which has already proved popular. 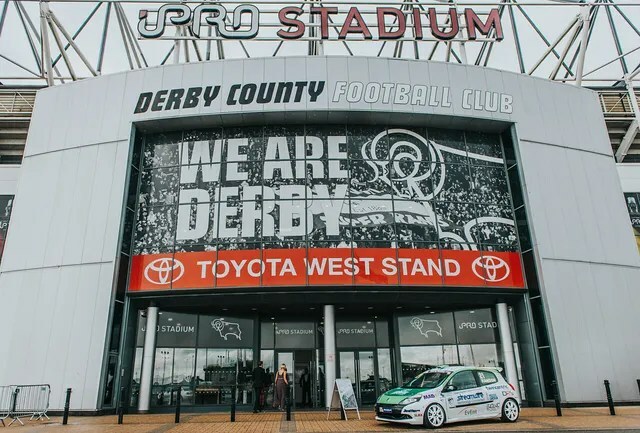 Each separate roof sponsor results in a donation from Sam to the me&dee charity, run by Derby fundraiser Maria Hanson MBE. Each donation funds a short holiday for families dealing with serious or terminal illness. “We’ve already sold three slots and funded three holidays” said Sam who will be guest speaker at the charity’s Summer Ball in July. 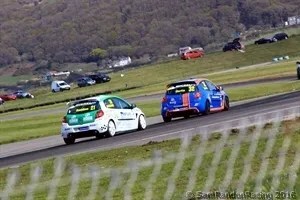 SAM Randon sets out on his third tilt at the Michelin Clio Cup series on Saturday at Oulton Park in Cheshire. The Ashbourne racer, now 21, hopes this year’s series will see him mount a genuine title challenge after being close to doing so previously. 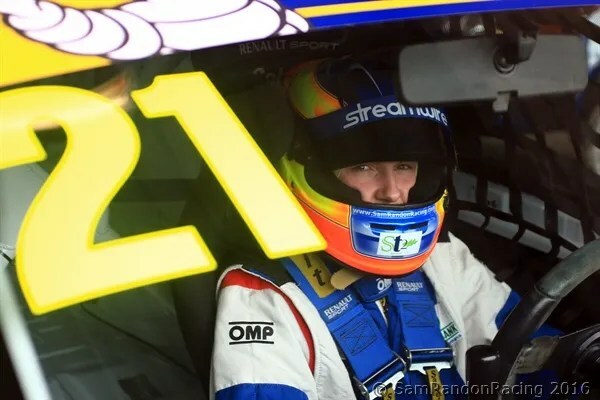 He remains with the now well-established Westbourne Motorsport family-run race team, under the tutelage of experienced racers Ed Pead and James Colburn. This season, the budget has allowed for several productive pre-season test days. 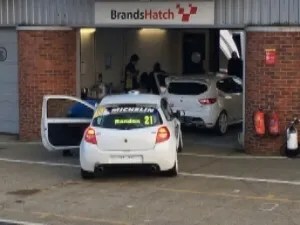 Attempting to leave no stone unturned, Randon has also been working on a professional simulator (like a big X-box game) at Silverstone to learn the new tracks and get back into the seat. Compared to a real test day, it is a low cost way of getting in some practice. 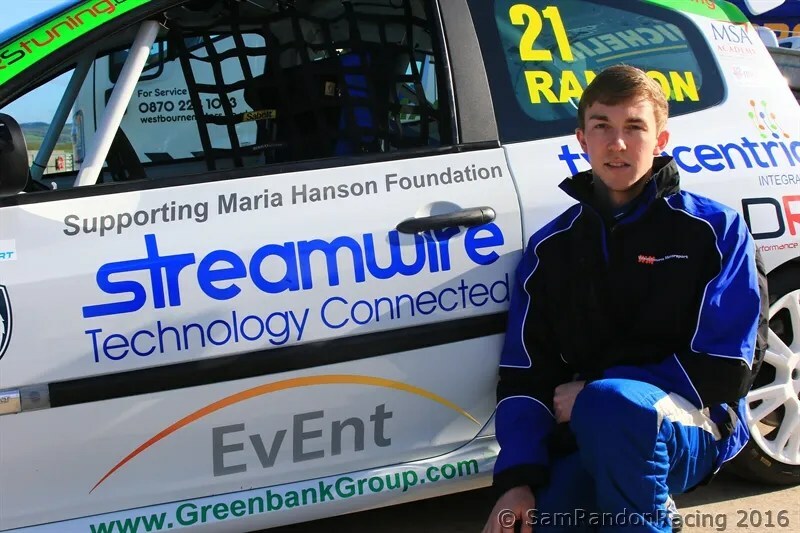 Randon was not lucky in a number of rounds last season but his potential is such that most sponsors from 2015 remain on board, including main backers Greenbank Group, who have been joined by a new prime sponsor in Streamwire, a computer services company. By the end of this season, Randon hopes to attract further sponsorship to double his racing budget, which will make the next step of his career possible. He is also continuing to support local charity the Maria Hanson Foundation. 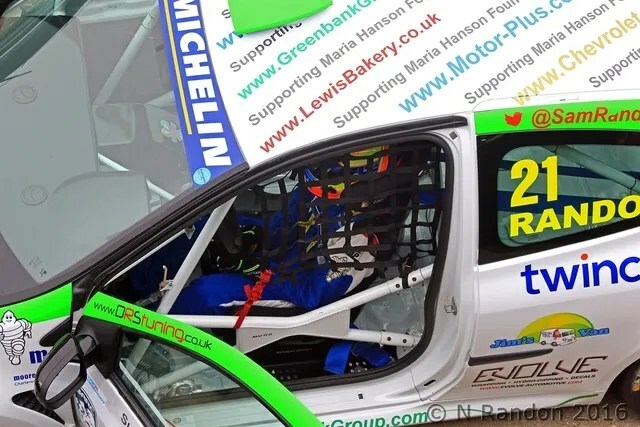 He will host families dealing with serious illness at race days and donate some of the proceeds from sponsorship of the car’s roof to fund a family holiday via the charity.